When genocidal violence gripped Rwanda in 1994, the international community recoiled, hastily withdrawing its peacekeepers. Late that year, in an effort to redeem itself, the United Nations Security Council created the International Criminal Tribunal for Rwanda to seek accountability for some of the worst atrocities since World War II: the genocide suffered by the Tutsi and crimes against humanity suffered by the Hutu. But faced with competing claims, the prosecution focused exclusively on the crimes of Hutu extremists. No charges would be brought against the Tutsi-led Rwandan Patriotic Front, which ultimately won control of the country. The UN, as if racked by guilt for its past inaction, gave in to pressure by Rwanda's new leadership. With the Hutu effectively silenced, and the RPF constantly reminding the international community of its failure to protect the Tutsi during the war, the Tribunal pursued an unusual form of one-sided justice, born out of contrition. Fascinated by the Tribunal's rich complexities, journalist Thierry Cruvellier came back day after day to watch the proceedings, spending more time there than any other outside observer. Gradually he gained the confidence of the victims, defendants, lawyers, and judges. Drawing on interviews with these protagonists and his close observations of their interactions, Cruvellier takes readers inside the courtroom to witness the motivations, mechanisms, and manipulations of justice as it unfolded on the stage of high-stakes, global politics. It is this ground-level view that makes his account so valuable—and so absorbing. 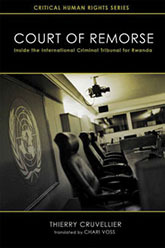 A must-read for those who want to understand the dynamics of international criminal tribunals, Court of Remorse reveals both the possibilities and the challenges of prosecuting human rights violations. Thierry Cruvellier, an investigative journalist, covered the International Criminal Tribunal for Rwanda from 1997 to 2002. Since then he has reported on tribunals in Sierra Leone, Bosnia-Herzegovina, and Cambodia. Cruvellier also founded the International Justice Tribune, an online magazine covering international criminal justice. Chari Voss is a French-English interpreter and translator based in Washington, D.C., who spent two years interpreting the genocide trials at the UN International Criminal Tribunal for Rwanda (ICTR). "A remarkable anatomy of selected cases. . . . Cruvellier's depiction of the atmosphere and characters inside the courtroom is gripping. He never lets the reader forget the human and personal implications of the proceedings he is describing."